At Quality Palms we specialize in providing the most luxurious specimen palms & trees available anywhere. Our Palm Trees are of the highest quality stock, make your landscape stand out with one of our beautiful specimen palms. 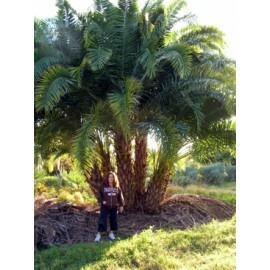 The Canary Island Date Palm is a palm tree of the highest quality stock for landscaping in southern U.S. States. Also called the Phoenix Canariensis is a species is native to the Canary Islands located in the Atlantic Ocean near the northeast African coastline. Canary Island Date Palm Trees are a very popular form of landscape palm in warmer climate areas around the world. Canary Island Date Palm Trees can grow up to 60 feet in height and have a thick appealing diamond pattern design on the trunk. The crowns can grow in upwards of 18' feet with very large arching pinnate leaves. Another name for the Canary Island Palm Tree is the Pineapple Palm, this is a more common English name for the Phoenix Canariensis. In Spanish speaking countries it is also referred to as the Palmera Canaria. 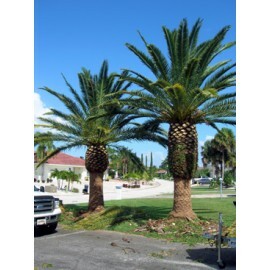 If you are looking for the finest Pinapple Palm Trees in North America than look no further, at quality palms our Pinaepple Palm trees are Florida grown with the highest care, with your landscaping needs in mind. 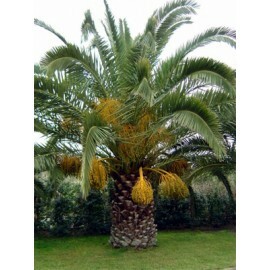 Also referred to as the Senegal Date Palm falls under the Arecacea family of palm trees. This exquisite and strange palm tree grows in large clumps that can make an impactful statement in any landscaping. The Phoenix Reclinata comes in a variety of shapes and forms but tends to grow in groups of stems reaching up over 25 feet in height. 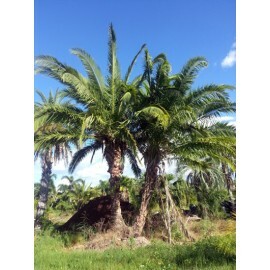 At Quality Palms we provide nothing but the highest quality Florida Farm grown Reclinata palms. At a Quality Palms we also grow Hybrid Date Palms. Date Palms will hybridize regularly and lead to some intriguing palm tree combinations. Canary Island Date Palms, Sylvester Palms, Roebelenii Palms, Medjools and Reclinatas are the most common forms of date palm hybrids in Florida. Hybrid Date Palms can lead to some truely unique and spectacular tree specimens. 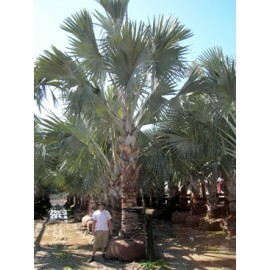 A taller, thinner, spiker variety of Phoenix Dactylifera known as the Medjool Palm Tree has a more bluish tone to its leaves than its relative the Canary Island Date Palm. The Medjool Palm has excellent drought resistance and is a great choice for dry climates as well as warmer tropical climates. Because of its predictable growth pattern and beautiful appearance, the Sylvester Palm has become a popular choice for golf courses and other venues that need slow-growing trees that don't shed excessively. At Quality Palms we offer wholesale palms direct to the public, save on your landscaping with quality luxury palm trees at a great price. If you’re looking for palm trees for sale in Florida, Quality Palms can provide you with luxurious specimen palms of the best quality. we offer Canary Island Date Palms, also called Phoenix Canariensis, native to the Canary Islands, and the Atlantic Ocean. 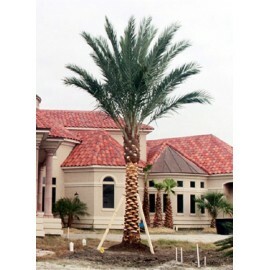 If you’re looking for palm trees for sale in Georgia, At Quality Palms we provide our customers with the finest stock of Southern grown specimen palm trees. If you’re looking for the finest quality in Tropical landscape hedging to create an exotic landscape then look no further than our Florida grown wholesale landscape hedges.